2015 grassroots fundraising efforts were very successful! Adam Klafter sold his signature “Butterfly” greeting cards raising money for FIRST, as part of his project for his Bar Mitzvah. Adam, who has epidermolytic ichthyosis, designed the butterfly artwork when he was eight. He raised $355 for FIRST programs and services. At the Northwestern University patient picnic held in June, Michael, Aurora and Matthew Green presented FIRST with a check for $254.44, funds they raised organizing a Penny Challenge through their school. Great job! 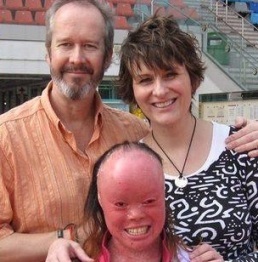 Roger and Tina Thomas lectured at a local school in Hong Kong about their daughter, Mui who is affected by harlequin ichthyosis. The school was so moved by the speech that they donated over $700 to FIRST. 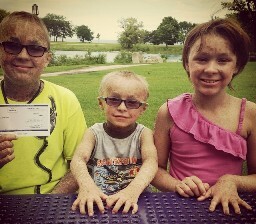 Thank you to the Thomas family for continuing to raise awareness of ichthyosis across the world! Bergseth Bros. Co., Inc. in Fargo, North Dakota for raising $300 in honor of the Linman family, whose daughter Isabelle is affected. Paine Intermediate School in Trussville, Alabama for raising $210 and celebrating the Ekonen family, whose daughter Annalie has ARCI-lamellar type ichthyosis. Paychex in East Providence, Rhode Island for raising $397 and having a Jeans Day for Rare Disease Day, in honor of the Robinson family, whose daughter Sienna has epidermolytic ichthyosis. Auburn Elementary School in Shelby, Ohio, wore green and jeans in support of student Brennan Lewis, who has ichthyosis. Staff and students were invited to make donations in support of FIRST. All together, they raised over $200. LuLu Roe by Corey held a clothing fundraiser to support Candace Smith’s son. The event raised over $88 for FIRST.